Atlanta Fly Fishing Club – The Largest & Most Active Fly Fishing Club in Georgia. Big T will go over what you should do to improve the odds of catching trout based on the conditions present. Born and raised in Atlanta GA, Stephen aka “Big T” found his love for fishing in Michigan, where his family would take an annual vacation to visit Grandpa Ray. Once he caught the fishing bug it never left, and anywhere he found a body of water he had a line wet. Big T mainly fished for warm water species in ponds, on Lake Lanier, and Lake Hartwell. He would frequently pull a fly rod out to throw poppers to bream and bass. Big T’s species of choice and love of fly fishing changed several years ago while driving across the Chattahoochee River. He fell so in love with the pursuit of trout on the long rod a few years later he would make a career out of it. Big T is the owner of Big T Fly Fishing, an online Fly Shop and Guide Service. 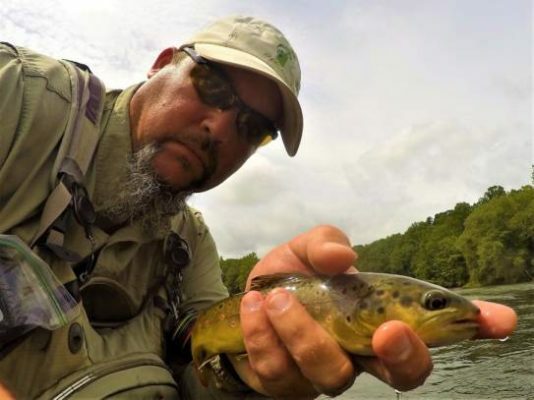 As a member of Team Dead Drift, “Georgia’s First Competitive Fly Fishing Team”, he has several top finishes. In addition, he serves as a mentor in the Re:New program at Browns Bridge Church and is on the Board of Directors of the non-profit North Georgia Trout Online. He currently resides in Suwanee GA with his wife and son.